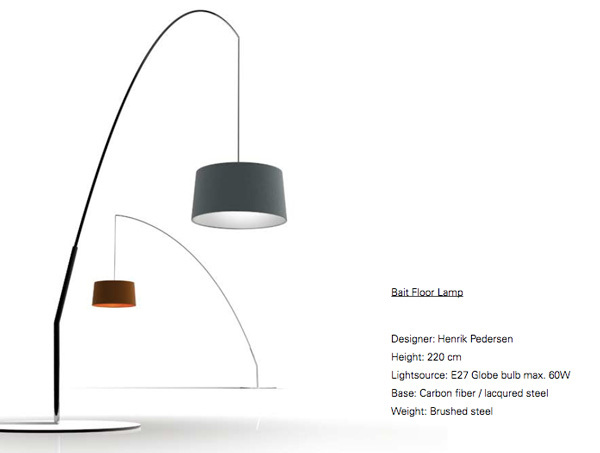 We came across this Bait Lamp designed by Henrik Pedersen for the Frandsen Projekt at ICFF, and i must admit, it didn’t look like much to me, until i lost Dan, only to find him with the booth guy playing with this lamp… and then it suddenly became really sweet. 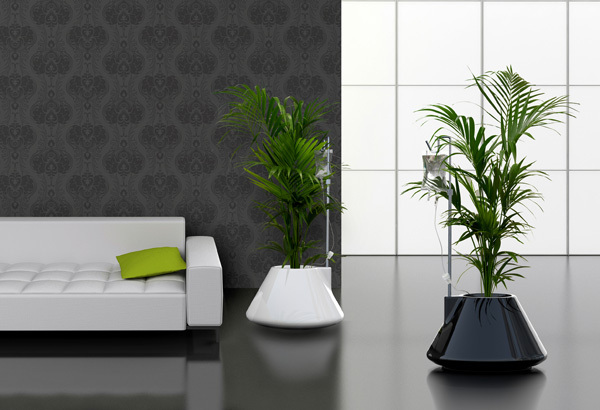 It has a carbon fiber rod, and on it is a movable brushed steel weight, and using the weight as a counter balance you can slide it along the lamp to adjust the height of the lighting, and the carbon fiber rod will naturally adjust its curve! Really, you need to see it in action to make sense of it… so luckily we made a quick video clip you can check out to illustrate how it works. Unfortunately there is minimal information on the the Frandsen Projekt site, but we did find it in the catalog/pdf. Watch our little video on the next page! p.s. we’re internally debating whether the lamp we saw is the same lamp in the press images, but the booth guy gave us the press kit saying it was in there, and this is the closest thing to it…….. it is a bit weird that the press image has the shade hanging so much lower, perhaps that’s adjustable? Myto Cantilever Chair for Plank designed by Konstantin Grcic. There are some chairs that while look interesting in images, they just don’t grab you until you sit in them. Clearly the folks at Plank knew this when they set up their ICFF booth, and it was fascinating to watch everyone from little kids to grannies jump up on the platform, and sit, lean, bounce on these colorful plastic stackables. After a bit of watching, i couldn’t resist either, and they were REALLY quite nice to sit in! Not to mention light and easy to store and not too hard on the eyes! 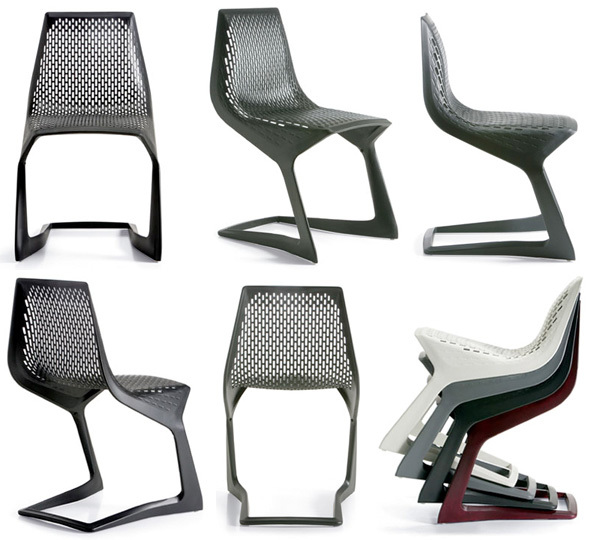 Check out more images of the chairs in all its colors as well as the ICFF booth on the next page! At their booth, the first thing to pull you in is the new fiberoptic/porcelain chandelier with leaves (much like the Niagara Chandelier with the fairies), and seeing how the fiberoptic strands were attached to the porcelain leaves was fascinating (as was the lighting itself). Next the Re-Cyclos tea set where the legs of a bowl were all porcelain horse heads, the napkin ring made of horse legs, the handles on the cups and mugs were horse legs as well! Really in description it sounds far more bizarre than the result, the juxtaposition was really quite beautiful (see the pics on the next page). Also fascinating were the porcelain boxes that have what look like barbie and ken faces pressed into them (complete with makeup for that dash of color), they actually turned the molds used to create the figured into the boxes themselves, in a stark matte porcelain and a gold interior. 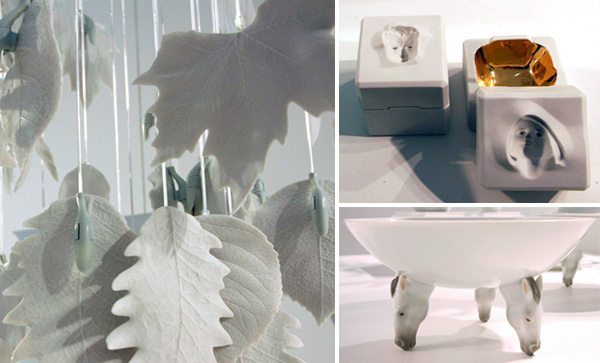 As you can see, its really not the usual collection of porcelain collectibles you’d expect, and really they seem like a fun match for some pieces over at the Designboom Mart, like the Blaue Blume Tea Set. Lladró ~ for a company that i grew up knowing for beautiful traditional porcelain pieces, you fascinate me with every part of your evolution. I never expected a bizarre and edgy collection quite like this from the 50+ year old company, and love it! More pictures from the booth on the next page! 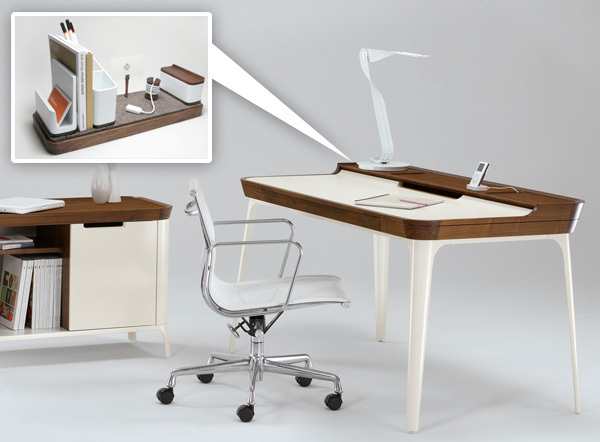 So here is their latest project, Airia desk and media cabinet for Herman Miller. 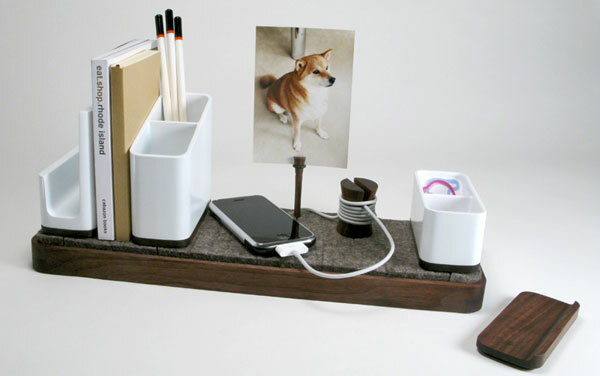 And its gorgeous down to the tiniest details… when you see this in person, be sure to check out the perfect wood pieces with rubber feet to keep your cables hidden and the cork lined trays that make organizing your drawers easier than ever. It really is nice to see a desk that goes out of its way to not only look good, but help make hiding the inevitable cable clutter during use. See both press images and ICFF show floor shots on the next page ~ as well as a really nice little profile on the company. With a billion things/people/places to see, and a seemingly endless events to attend… its been super fun, in that crazed hectic way, and now i’ve taken the day to enjoy my bed - that is literally COVERED in press kits and a desktop filled with hundreds of photos… its a work day! 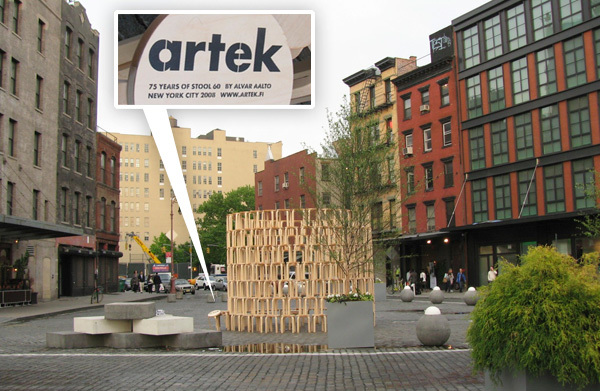 To catch up on some posts… and today, we’ll start with the incredible Artek installation in Gansevoort Square. The simple Artek Stool 60 has been an omnipresent design icon… from schools, jails, kids rooms, restaurants, you’ll see them everywhere… but no where is it as amazing as walking into Gansevoort Square and seeing what from afar appeared to be a coliseum of them. As the press release says… “The innovative and strong L-leg construction is based on the technique of bending solid wood that was invented and refined by Alvar Aalto and Artek from the 1930s onwards. 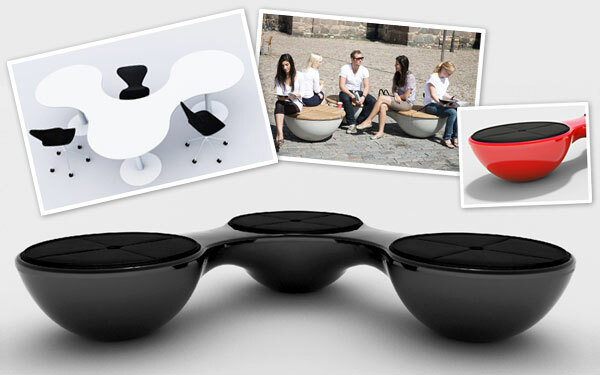 The famous Stool 60 designed in 1933 is the archetype of functional furniture. In Gansevoort Square, New York, Artek celebrates the anniversary of the stool 60 by building an installation of hundreds of stools. The round tower invites people to use all their senses to experience the installation. The stools made of untreated birch bring the scent of pure forest in the middle of New York and people are free to feel the natural, refined surface and structure of the stools.” Check out my pics on the next page for the full experience! ICFF previews are filling the inbox, and i’m getting giddier every day as we close in on NY Design Week (still kicking myself for not being able to make it to Milan this year! 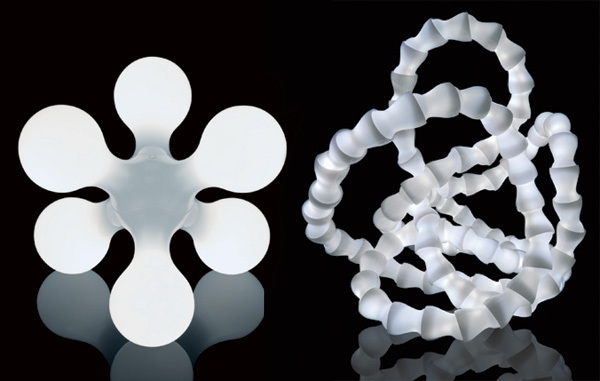 )… Check out the Abyss by Osko & Deichmann and Atomium by Hopf & Wortmann, both for Italian company, Kundalini. I wrote a post about Studio Lo a few months ago. 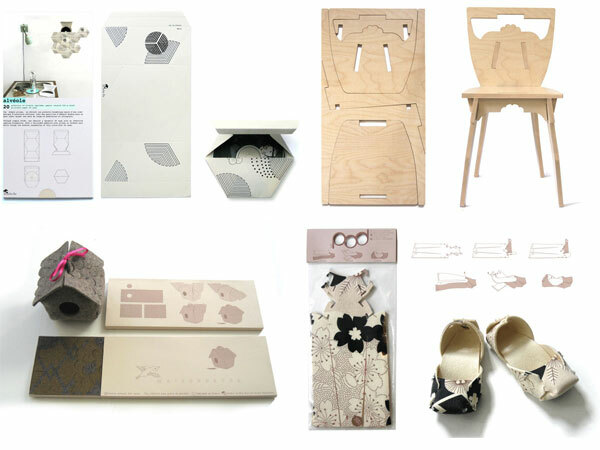 I was (and remain) struck by Studio Lo’s minimal use of materials, gorgeous packaging, and the way each object is flat-packed and constructed by you, the user. In order to get more insight into their work and process, I decided to ask them a few questions about their work and process, and Eva Guillet and Aruna Ratnayake were kind enough to let me interview them. Check out the interview after the jump. 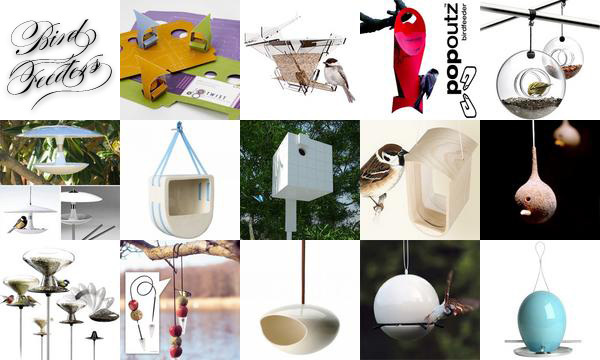 Take a look at the close ups of the tub, tiling, and other playful collages on the next page! Browsing IKEA’s latest today… they’ve jumped on a few trends i’ve been liking for a while… so naturally much like the laptop station that they made 10% of the original price… funny to see that they have taken to the vinyl stickering (i had kind of expected them to get on this one sooner since its so cheap/easy to produce)… and one trend i’ve been loving for apt dwellers that move frequently and don’t want to worry about damaging the walls, yet want to mount that flat panel tv - the floating wall tv shelves, i’m kind of liking this Stiby one above that is $500… and there is also the Benno after the jump that is a mere$120. 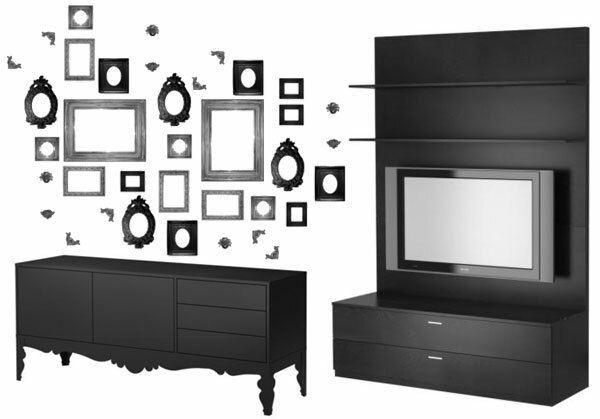 Now for the one piece i’m really really wanting - the Trollsta Sideboard… granted the whole series feels like a cheap jaime hayon knockoff… i’m still tempted. It looks really fun to add some subtle vinyl stickers to also…. few more pieces that grabbed me after the jump! Here’s that press announcement i’ve been dying to share with you…. New York, NY—April 15, 2008 — Champagne house Veuve Clicquot affirms its strong commitment to design excellence, innovation and audacity with the release of Globalight by Karim Rashid, the second collaboration between the eponymous Champagne House and the prolific designer celebrating Veuve Clicquot’s Rose Champagne. The unique, limited-edition piece represents Rashid’s modern reinterpretation of the traditional French chandelier, icon of romantic dinners and meaningful moments. In the United States, Globalight will be unveiled exclusively at W Hotels, leader in modern travel, luxury design, and sensory experience. Its portable nature makes entertaining a gathering of friends or someone special a charming occasion whether at home or on the road. 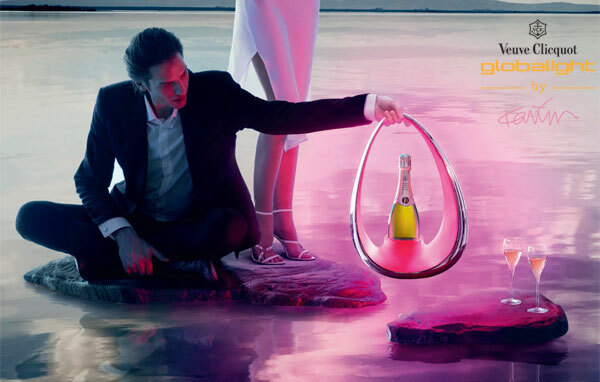 One bottle of Veuve Clicquot Rose will remain chilled for 4 hours and the LED lights will give a soft glow for the same time, making Globalight an ideal accessory for outdoor entertaining. 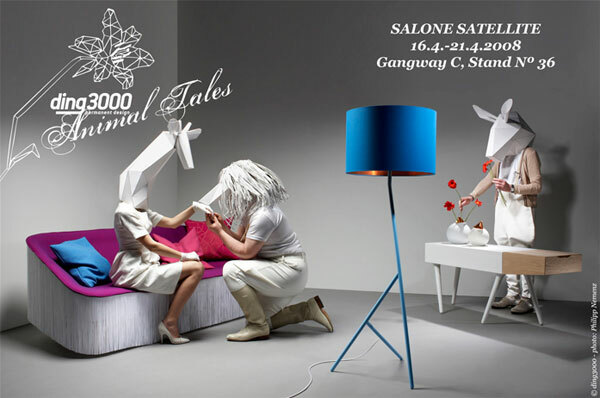 Ding3000 is gearing up for this year’s salone in milan, and their theme is Animal Tales!